In December 2010, the two countries upgraded their bilateral ties to a ‘Comprehensive Strategic Partnership of Cooperation.’ Cambodia continues to attach great economic and strategic importance to China’s rise. Economically, China plays an increasingly important role in the socio-economic development of Cambodia as its primary trading partner, largest source of foreign direct investment, and top provider of development assistance and soft loans. Noticeably, two-way trade between Cambodia and China grew from $2.34 billion in 2012 to around $3.3 billion in 2013. Recently, the two countries agreed to boost their bilateral trade to reach the target of $5 billion by 2017. Similarly, Chinese investment in Cambodia in 2013 rose 65 percent, to $435.82 million compared to $263.59 million in 2012. More importantly, Chinese loans and grants to Cambodia reached $2.7 billion in 2012, making it one of the latter’s largest donors. Moreover, Cambodia will reap enormous benefits from new Chinese initiatives such as the Maritime Silk Road and the Asian Infrastructure Investment Bank. 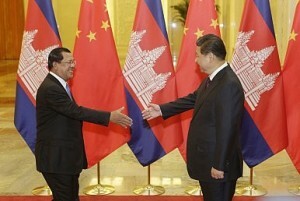 Militarily, China is the biggest source of assistance to Cambodia’s armed forces in various forms. 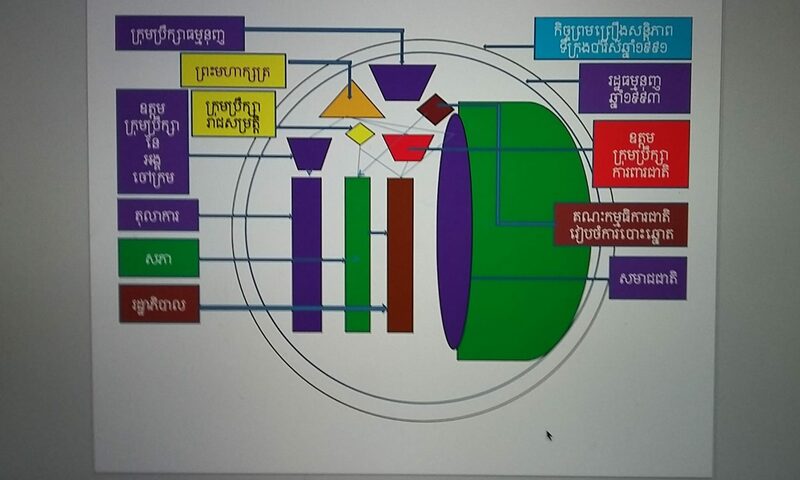 In May 2012, Cambodia and China signed a military cooperation agreement in which China agreed to provide $17 million to Cambodia to build military hospitals and military training schools for the Royal Cambodian Armed Forces and promised to continue training military personnel in Cambodia. The latter is, according to Cambodian Defence Minister Tea Banh, a “great contribution to improving the Cambodian army’s capacity in national defense.” It is worth noting that Chinese military assistance increased remarkably at a time when Cambodia badly needed to build up its defense forces due to the increasingly tense border dispute with Thailand from 2008 to 2011. In geopolitical and strategic terms, Cambodia had been a victim of its location as a country sandwiched between two powerful and historically antagonistic neighbors, Thailand and Vietnam. The history of Cambodia vividly suggests that over the six hundred years following the fall of the Khmer Empire, Thailand and later Vietnam regularly defeated Khmer armies and annexed Khmer territories. The two countries had always attempted to impose their suzerainty over Cambodia. Cambodia’s acceptance of the French protectorate in 1863 was an escape from suzerainty. The eruption of a border conflict with Thailand from 2008 to 2011 reminded Cambodian leaders that its stronger neighbors remain a security threat to the kingdom’s territorial integrity. It also prompted Cambodian leaders to rethink the Association of Southeast Asian Nations’ (ASEAN) role in maintaining peace and stability in the region. In fact, since becoming a member of ASEAN in 1999, the regional grouping has always been the cornerstone of Cambodia’s foreign policy. Cambodian policymakers were convinced that ASEAN would be a crucial regional platform through which their country could safeguard its sovereignty and territorial integrity as well as promote its strategic and economic interests. However, it seems that Cambodia’s confidence in ASEAN has faded due to the grouping’s ineffective response to the Cambodia-Thailand border dispute.